Important service town on the Atherton Tablelands known as the Capital of Cape York. Mareeba, an important regional service centre, is the largest town on the Atherton Tablelands. It lies at the heart of the tableland's agricultural activities and is surrounded by coffee plantations, mango and paw paw farms, avocado farms, macadamia nut plantations as well as sugar cane fields and orchards specialising in pineapples, bananas and cashews. Mareeba is located 1,723 km north of Brisbane, 62 km south-west of Cairns and 417 metres above sea-level. Mareeba is located at the junction of the Barron River and Granite Creek and consequently it is believed that the name of the town is the local Aboriginal word meaning "meeting of the waters" or "place to meet". 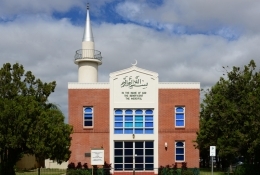 Located on the corner of Lloyd and Walsh Streets one block to the east of Byrnes Street (the main street) is the Mareeba & District Memorial Mosque. Built by the town's Albanian community, it was constructed in 1970 and has been Mareeba's place of Islamic worship since then. Muslims from Albania started arriving in the district in 1930s. They worked in the sugar cane fields and later in the tobacco plantations. By 1952 they had found a place to worship and this turned into this unusual building in 1970. It is a memorial to the soldiers who have fought to defend Australia. For more information check out http://monumentaustralia.org.au/themes/conflict/multiple/display/105160-mareeba-and-district-memorial-mosque. In 2014 the mosque was vandalised during a time of anti-Islamic feeling. The local community apologised to the Muslim community. Located at 345 Byrnes Street, the Mareeba Heritage Museum & Visitor Information Centre is a modern building which was opened in 1995. The exhibits, all located in a large room behind the Information Centre, include a section on mining, another of early settlers, another on the explorers in the area, the town's role in World War I and an extensive collection of local Aboriginal artefacts. Out the back there is a blacksmith's shop, a railway ambulance, a post and telegraph exchange and, most interestingly, a Tobacco Display - a reminder of the importance that tobacco production played in the economic life of the area. At one point tobacco from the district accounted for 70% of all tobacco grown in Australia. The museum is free. For more information check out https://mareebaheritagecentre.com.au/mareeba-heritage-museum-exhibits. Tel: (07) 4092 5674. Open seven days 9.00 am - 5.00 pm. Located at 136 Mason Street and proudly describing itself as a "roastery + chocolaterie", Coffee Works celebrates the fact that 70% of coffee grown in Australia is grown in the Mareeba area. Four distinctive local coffees are offered. It is open from 9.00 am - 4.00 pm daily. Part of the cafe is Coffeeworld - a coffee museum with a collection of coffee and tea treasures which date back to the 1700s. For more information check out https://coffeeworks.com.au. The Skybury plantation is located 14 km west of Mareeba at 136 Ivievic Road, (off the Mareeba-Dimbulah Road) and is spread across 150 ha and is the oldest coffee plantation in Australia. It produces Arabica coffee and exports 50% of its crop. There is a cafe where both the coffee and the tropical fruit (red papaya and bananas) from the plantation are served. It is open from 9.00 am - 4.00 pm Monday to Friday. For more information check out http://www.skybury.com.au. Mareeba was first settled by John Atherton in 1880. There is a monument at the northern end of the town which declares: "John Atherton - 1837-1917. Pioneer of the Tableland. Founder of Mareeba. Settled at Emerald End Station on the 'Barron' 1876. Discovered tin and named locality Tinaroo. Led party to Wild River (Herberton) where he had previously discovered tin. Erected Mareeba's first house near this site 1880". Atherton was by nature a generous man and his house, at the time the only one in the region, became a popular stopping off point for miners, teamsters and Cobb & Co. coaches on their way from Port Douglas to the Herberton and Hodgkinson River goldfields. Granite Gorge is a privately owned and run collection of huge granite boulder which is located 12.5 km west of Mareeba on Chewko Road. The Granite Boulders were formed by relatively recent volcanic activity which forced up these huge, dramatic and unusual balls of stone. They have slumped across the landscape and a stream (which obviously becomes a torrent during the wet season - look for the flood debris in the nearby trees) winds through the area. One of the great attractions, apart from the rock formations, is the large number of rock wallabies which are in the park. As well there are over 200 species of birds as well as possums, gliders, frilled necked lizards, quolls, turtles and echidas in the gorge. It is also has cabins and is a camping destination. For more information check out http://granitegorge.com.au, tel: (07) 4093 2259. Located 19 km north west of Mareeba, off the Mulligan Highway on an 8 km dirt road, the Mareeba Tropical Savanna and Wetland Reserve is run by the Wildlife Conservancy of Tropical Queensland. It is a wonderland with the central highlight being the 300 ha Clancy's Lagoon which can be so rich in birdlife that over 70 species have been observed in a single day. The website explains: "The Reserve, which is a designated Nature Refuge recognised by the QP&WS, is known locally as the Mareeba Wetlands and lies within the traditional Country of the Muluridji people; protecting over 5000 acres of savannas and wetlands and providing a sanctuary for much of tropical Australia's savanna and wetland flora and fauna, as well as its cultural heritage." It was established in 1996. The reserve is open from 10.00 am - 4.00 pm Wednesday to Sunday from April to December and offers guided boat trips, canoe hire and interpretative walks. There is a very detailed and informative website at http://www.mareebawetlands.org. * Prior to the arrival of Europeans the area was home to the Muluridji Aboriginal people. * In 1880 a road was built from Port Douglas to the goldfields at Herberton. At that time John Atherton built an inn and store at Granite Creek. * In 1893 the Cairns to Kuranda line was extended to Granite Creek which changed its name to Mareeba. That year a school and the post office were opened. * Around the time of the arrival of the railway a Jack & Newell general store was opened. * In 1894 a hospital was opened in the town. * In 1895 the Mareeba Express began publication. * By 1897 the town was operating the Barron Meat Company's preserving works. * Mareeba became an important railhead. There were rail lines to Herberton and Ravenshoe; Chillagoe and Mungana (1901). * A sawmill began operation in 1903. The Barron High School opened that year. * In 1909 a rail line was completed to Einasleigh. * A branch line was constructed to Mount Mulligan in 1913. * Tobacco was first grown in the area in 1928. * An irrigation weir was opened in 1937. * In 1958 the Tinaroo Dam was completed. * By 1988 there were over 400 tobacco farms around the town. * In 1995 the town's Heritage Museum was opened. * In 2005 the heritage centre presented a history of tobacco farming in the area. * By 2011 the town's population was over 10,000. Mareeba Heritage Museum & Visitor Information Centre, Centenary Park, 345 Byrnes Street, tel: (07) 4092 5674. Open seven days 9.00 am - 5.00 pm. There is a useful, downloadable brochure on the Atherton Tablelands (Mareeba is on page 43) at http://www.athertontablelands.com.au/wp-content/themes/tropical-tablelands-tourism/sources. The main street of Mareeba. 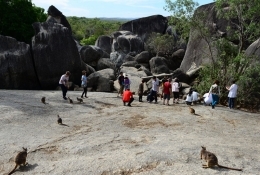 Tree wallabies entertain visitors at Granite Gorge Nature Park. The rounded granite formations at Granite Gorge Nature Park. A tree wallaby and joey at Granite Gorge Nature Park. The Mareeba Heritage Museum and Visitor Centre. 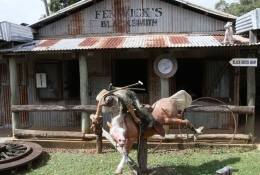 The Blacksmith's shop and a sculpture at the Mareeba Heritage Museum. The special tobacco exhibition - a reminder of times past - at the Mareeba Heritage Museum. 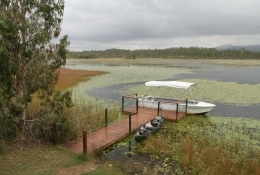 Clancy's Lagoon at Mareeba Tropical Savanna and Wetland Reserve. A white-necked heron at Mareeba Tropical Savanna and Wetland Reserve. A curious emu pokes his head through the car window on the road to the Mareeba Tropical Savanna and Wetland Reserve.